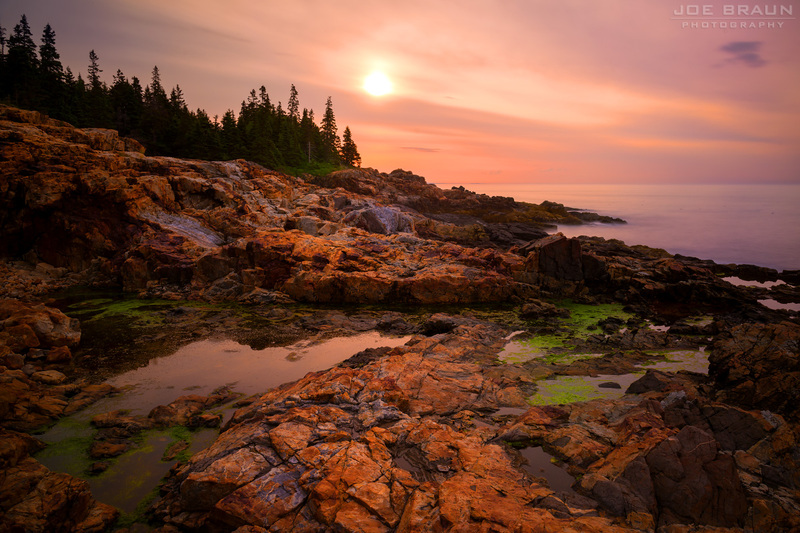 Named "the island of bare mountains" by French explorer Samuel de Champlain, the 108-square mile Mount Desert Island is home to Acadia National Park which occupies roughly 73-square miles of the island. Navigating the island may seem daunting at first as scattered sections of national park are interspersed with tourist and fishing towns and private property. Located in the northeast corner of the island along Route 9, Bar Harbor is the bustling tourist town of the island and is the lodging destination for most tourists, while several other smaller towns, such as Northeast Harbor and Southwest Harbor, are smaller fishing, vacation, and residential communities. The most popular section of Acadia National Park is eastern coastline where the Park Loop Road runs along Ocean Path. The middle of the island is home to Acadia's tallest peaks, including Cadillac Mountain, Pemetic Mountain, and Sargent Mountain. And the side of the island west of Somes Sound affectionately known as the "quiet side" has more mellow hiking opportunities interspersed with private property. Driving around the park may seem a bit confusing as the Park Loop Road is one-way going clockwise around the coastline, but it is two-way in the middle of the island near Cadillac Mountain and the Jordan Pond House. Many hikes and landmarks are located along Route 3 which does its own loop around the the island, but while Route 3 and the Park Loop Road cross several times, they do not intersect along the south side of the island. 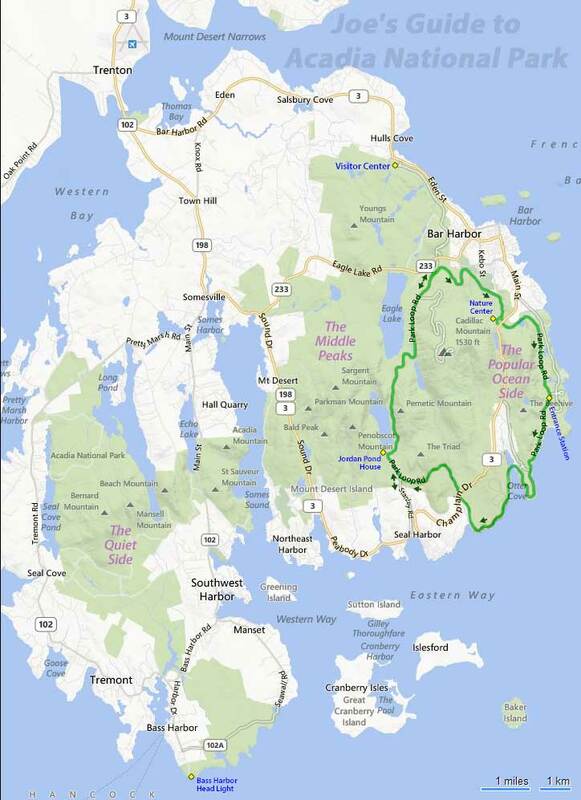 The Map Adventures Acadia National Park Trail Map is invaluable for navigating the island. During the crowded summer months, the Island Explorer free shuttle service is a great way to get to landmarks without having to fight for parking. Page 4: Seasons, Fees, Lodging, etc.